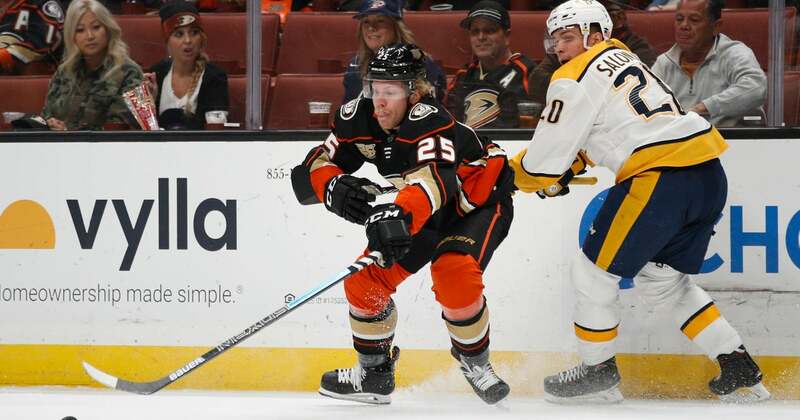 ANAHEIM, Calif. (AP) — Pontus Aberg and Rickard Rakell scored in the shootout, John Gibson made 34 saves and the Anaheim Ducks dealt the Nashville Predators their first road loss of the year with a 2-1 victory on Monday night. Rakell scored in the fourth round of the shootout to give the Ducks the 2-1 lead. Gibson then stopped Kevin Fiala for the win. Fiala scored in regulation and Kyle Turris in the shootout for Nashville, which had a five-game winning streak snapped. Pekka Rinne made 29 saves. It was the Predators’ first shootout of the season. Nashville had won its first eight road games, which is a franchise record but also the third-longest road win streak to begin a season in league history. The 2006-07 Buffalo Sabres won their first 10 games and the 2009-10 New Jersey Devils reeled off nine straight. The Predators Ryan Johansen thought he won it with a wide open shot on the power play late in overtime but Gibson made a diving stop. Getzlaf gave the Ducks the lead with 30 seconds remaining in the second period when he took a backhand pass from Rakell and tipped it past Rinne for his ninth of the season. The Ducks captain has points in six of his last eight games, with four goals and five assists. Fiala tied it three minutes into the third when he beat Gibson with a shot from the left faceoff circle. It was the left wing’s second goal, and first in 10 games. NOTES: The Predators placed F Viktor Arvidsson on injured reserve with an upper-body injury. He is second on the team in goals with eight. … Nashville did not have a shot on goal the final 11:53 of the second period. … Ducks RW Ondrej Kase played in his first game. He had missed the first 18 games after suffering a concussion in the final preseason game. … Rakell has an assist in five of the last seven games. … Anaheim D Cam Fowler took a puck to the face on a shot by Nashville RW Craig Smith with 3:06 remaining in regulation.